The display of a mother and son’s bond never fails to tug at one’s heartstrings. 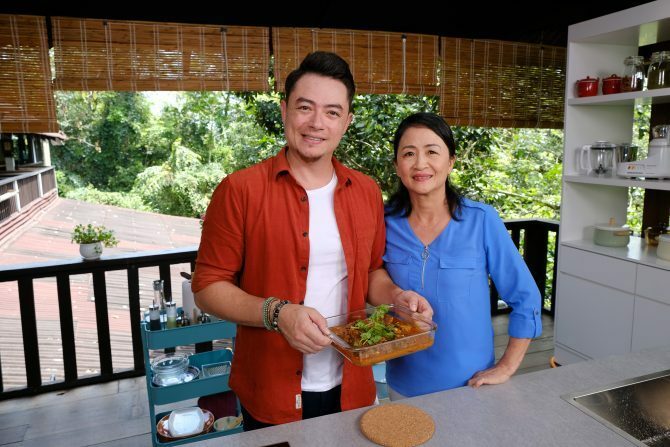 In the third season of “Family Kitchen with Sherson”, viewers can witness the onscreen chemistry between Malaysian celebrity chef Sherson and his mother Ann Lian, as they dish out home-cooked dishes that feature a modern twist. Aside from informative step-by-step demonstrations from these culinary geniuses, the eight-episode extravaganza will keep viewers entertained with witty banter and kitchen antics. Hi Sherson and Ann! What have you both been busy with lately? Sherson: I am at a crucial stage of opening a new restaurant in Kuala Lumpur! I need to ensure everything is ready for its launch. Ann: I’ve been travelling frequently to promote the new series. Family Kitchen with Sherson is now in its third season running. How have things changed since the first season? Sherson: My mom has definitely grown to be more comfortable cooking in front of the camera and she’s been bossing me around even more! 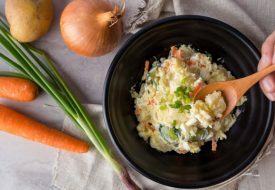 In this season, a lot of the recipes my mom has created, such as the Homemade Healthy Bar and Savoury Tapioca and Vegetable Pancake with Home Ground Brown Rice Flour, stem from healthy eating. Ann: I would say I have made some improvements on screen, but I am not nearly as comfortable as Sherson! 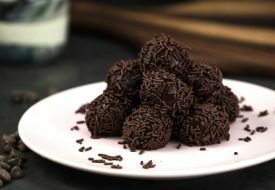 About the Homemade Healthy Bars, I actually created this recipe for myself as I am going through a “grey hair crisis” and I’ve read that black sesame can help to naturally blacken your hair amongst other benefits. So I hope it will work! I’ve only just started including black sesame more frequently into my diet recently, so I hope to see some results soon! How is it like working on set with a family member? Sherson: I think in Season One, we weren’t sure what to expect and what it would be like cooking with my mum but now we are in Season Three, it’s really all good fun. I’ve seen a funny side of my mom that I never knew before. Ann: Back in the day when we had to cook for more than 100 people a day, we used to argue a lot because we were cooking under pressure, but filming for Family Kitchen has been filled with fun and laughter. Sherson, your mum has been a big influence on your passion for cooking. How did she inspire you to pick up culinary skills? Sherson: I think it’s probably due to the fact that my mum opened a café when I was a very young age that exposed me to the food industry. Being not a studious, but rather hands-on kind of person, helping out at my mum’s cafe was my escape from school. I probably made my mind up to pursue cooking for a living when I was in secondary school. After that, I started to pay more attention when my mom was cooking, as well as from chefs in the kitchen. What’s your favourite dish, as created by each other? And why? Ann: Jackfruit Sago Dessert. I like to eat jackfruit so this dessert is perfect for me. Sherson: Sour Plum Duck has been my favourite since young. My mum cooks it once or twice a year, on Chinese New Year or special family celebrations, so I don’t get to eat it often enough to get sick of it. It is still my favourite dish till this day and I look forward to eating it every year. Could you each share your favourite cooking tip/hack with our readers? Ann: You must first be a foodie before you can love cooking, because you will only learn how to cook when you love to eat. You will want to replicate the same taste at home. That’s how my family is, we love food and our passion for cooking grew from our passion for food. Sherson: One of the things my mum has taught me is to cook with your instinct, rather than relying on the recipe. This requires a lot of practice but once you have developed that instinct, cooking will become second nature. Play around with the ingredients, and let your taste buds be your guide. 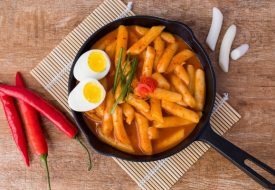 You can adjust flavours, make it savoury, sweeter or add in other ingredients to spice up the flavour, it’s really about striking a balance between flavours. Once you understand what each of your ingredients can bring, you will build a strong palate to achieve the perfect balance. Have you had any kitchen disasters? Share a funny story or two. Ann: When Sherson was a newbie in the kitchen, he splattered hot oil on my forearm, leaving me with a huge scald for months! Luckily, it has healed and left no scars. He’s really come a long way from being that newbie, he can cook better than me now! Sherson: There’s this one time, Chef Johnny and I were working on a Chinese New Year luxury dish, one of those really sophisticated dishes stuffed with lobster, crab, scallop, squid and more. However, we were just too ambitious having to cook for 500 guests! Since the prep time for the dish was long, we went to the venue early in the morning to get a head-start of things. Little did we expect to see it go wrong when we returned in the evening! We tried to salvage the situation by bringing it back to our place, but it was in vain. Finally, we whipped up something else to replace our dish. That was truly one of the worst disasters that has happened ever since I started my food business, and I hope that would the last time such a thing would happen. What’s your biggest guilty pleasure, in terms of food? Sherson: Deep-fried pork lard. I usually have it on the side when I have my Hokkien Mee. Remember when I say you must balance the flavours? This is one of it! I don’t feel the balance if I don’t have pork lard on the side when I am eating Hokkien Mee. Ann: Chicken skin, fried or otherwise. I know it’s not healthy, especially at my age, because it’s high in cholesterol and made up of unhealthy fats, but I can’t help but to indulge in its flavours and texture.